Above: Portrait of an unknown woman, possibly Katherine Howard (left). The Haunted Gallery at Hampton Court Palace (right). On 13 February 1542, two women were executed for treason within the walls of the Tower of London. On the same spot on which Anne Boleyn had been beheaded six years earlier, Katherine Howard was executed after making a short speech. Mercifully, her head was removed with a single blow of the axe. Following her death, it was the turn of her attendant Jane, viscountess Rochford. The viscountess had allegedly gone insane during her imprisonment; yet so determined was Henry VIII for her to die that he had her nursed back to health. Like the former queen, Jane was decapitated with a single strike. Both ladies were buried in the chapel of St. Peter ad Vincula. It is often believed that Katherine was executed for committing adultery with Thomas Culpeper, a groom of the privy chamber, but the Bill of Attainder passed against her clarified that she was condemned for having lived 'an old abominable life'. The attainder explained that Katherine's decision to appoint a former lover, Francis Dereham, to the position of secretary was 'proof of her will' to return to her 'vicious life'. In this respect, it was Katherine's unchaste childhood that counted against her. When it was discovered that she was not a virgin when she married Henry VIII, her meetings with Thomas Culpeper took on a sinister light. The Bill of Attainder became law on 11 February, a day after the queen had been taken to the Tower. Two days later, she and Jane Rochford were beheaded. Neither had been given the right to a trial, as Anne Boleyn had in 1536. The Act of Attainder was later repealed in the reign of Mary I. Having endured imprisonment for two months, Katherine's end came astonishingly quickly. Within three days she was imprisoned in the Tower and then executed. The Spanish ambassador Eustace Chapuys reported that Katherine had to be forced onto the barge 'with some difficulty and resistance' when it arrived to transport her to the Tower. Although both she and Jane were to die with dignity, rumours abounded both then and now that Katherine Howard's spirit was restless. This idea soon became legend with the story of Katherine's ghost haunting a gallery at Hampton Court Palace. 'There is a legend at Hampton Court Palace that Katherine Howard made one last, desperate attempt to see her husband. The story goes that, knowing Henry was at service in the Chapel Royal, she broke free of her rooms and ran down the long gallery to try and talk to him and convince him of her innocence. ...It is said that Katherine's ghost is seen here, running and screaming in her panic as she calls Henry's name... She was presumably caught long before she came anywhere near the King and dragged away by her guards'. Hampton Court Palace, on its website, provides 'anecdotal evidence' to confirm that the story is true: visitors to the gallery are often unsettled by a strange presence in the gallery, and some have fainted before. The story has moved into the realm of popular culture, and the link between Katherine Howard and the Haunted Gallery is well-known. It's not hard to see why. The image of a teenage queen, paralysed by fear and terror, running and begging for her life is a haunting one. The legend is often included in modern novels, such as Jean Plaidy's Rose Without a Thorn, and it is occasionally referenced in television, as in the Showtime series The Tudors (2007-10). But historians have, by and large, demonstrated that the myth is exactly that: a myth. There is no contemporary evidence that Katherine Howard ran down the gallery screaming for her life; none of the court ambassadors, including the well-informed Chapuys, reported it. Hampton Court Palace is central to the story of Katherine Howard. Its setting was the centre piece of her spectacular rise and was to prove the site of her calamitous downfall. Unsurprisingly, then, Katherine's ghost is almost never linked with the Tower of London, but it is always associated with Hampton Court. As a young maid of honour to Queen Anne of Cleves, Katherine had captivated the ageing Henry VIII; perhaps their first meeting occurred at Hampton Court. In August 1540, less than two weeks after Katherine married Henry at Oatlands Palace, she was acknowledged as queen for the first time at Hampton Court. Formerly in the hands of Cardinal Wolsey, it had become, by the 1540s, Henry VIII's main residence. As it had been the main setting for her rise to queenship, so Hampton Court was to be the setting for Katherine's downfall. Returning from the northern progress in the autumn of 1541, Henry VIII was confronted with a letter placed in the Chapel Royal informing him of his wife's unchaste childhood. Devastated, he departed the palace, never to see her again. The disgraced queen was eventually moved from Hampton Court to Syon, before making her final journey to the Tower of London. In January 2016, I visited Hampton Court Palace for a ghost tour held one evening. The final stop on the tour was at the Haunted Gallery, where the story of Katherine Howard's ghost was recounted by the guide. Undeniably, the Gallery has an unsettling atmosphere, especially at night. One's imagination can run away; it is easy to imagine a frightened girl frantically running down the Gallery, screaming and begging for her life before being seized by her guards and taken back to her rooms. While the story of Katherine's ghost has no basis in reality, it does provide a poignant, chilling reminder of the speed of her downfall and death. For Katherine Howard, Hampton Court Palace was initially associated with happiness, glory and possibility, but it later became for her a site of fear, terror and destruction. On 12 February 1554, Lady Jane Grey was executed within the walls of the Tower of London. Three months earlier, she and her husband Guildford Dudley had been found guilty of high treason. 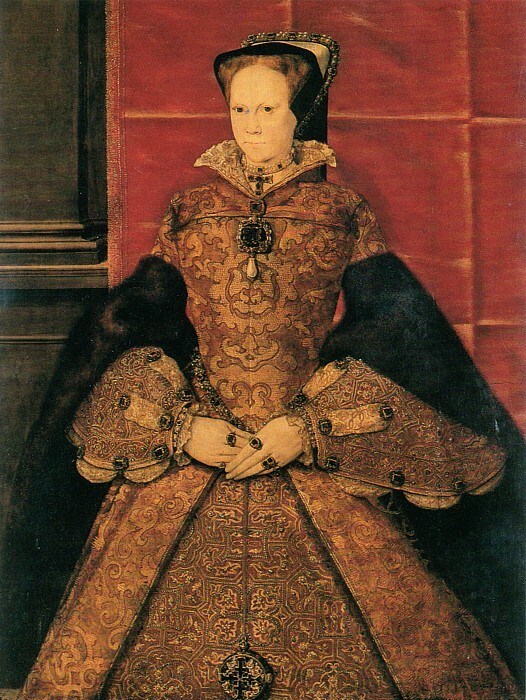 They had unlawfully usurped the throne from the rightful queen, Mary I. Traditionally, historians presented Lady Jane as an unwilling innocent, a much wronged young girl who had no desire whatsoever to be Queen of England. Recent research has disproved this legend. In actuality, Lady Jane was an intelligent, stubborn and resilient woman who was fiercely devoted to her Protestant faith. She regarded herself as appointed by God to rule England, and she likely regarded her Catholic cousin Mary Tudor as ungodly, even abominable in the eyes of God. He had chosen Jane to be Queen, and she believed it was her destiny to be sovereign of England. Having been selected as Edward VI's heir, Jane was proclaimed queen in July 1553. As is well known, Jane's regime collapsed within days, and Mary was declared queen on 19 July. Jane's trial followed in November, and although she and her husband were found guilty, Queen Mary showed no desire to have them put to death. However, the outbreak of rebellion in early 1554, motivated by dislike of Mary's decision to marry Philip of Spain, coupled with the decision to reinstate the medieval heresy laws, sealed Jane's fate. Her own father was involved in the plot against the queen, and he followed Jane to the scaffold a few days after her own death. A courageous and resourceful young woman, Jane accepted her fate and bravely prepared for death. Above: The traditional view of Lady Jane Grey, as portrayed in Paul Delaroche's nineteenth-century painting, as a wronged innocent. Guildford Dudley was executed on the morning of 12 February 1554 on Tower Hill, where his father, the duke of Northumberland, had died the previous August. Guildford was himself still a teenager, perhaps no more than nineteen years old, and has been the victim of notable slanders. Modern historians have usually depicted him as a snivelling, weak-willed and vicious adolescent, loathed by Jane, but Leanda de Lisle's research questions whether this portrayal is accurate, as no contemporary source describes Guildford in such a negative way. Whatever the truth of Guildford's character, his end was tragic. Like Jane, he was the victim of his father's plotting, and he duly resigned himself to his fate. His wife was confronted by the sight of her husband's headless corpse, the fabric stained with his blood, returning on a cart from Tower Hill. She knew that her own demise was imminent. Shortly afterwards, around ten in the morning, Lady Jane Grey walked out of her apartments and mounted the scaffold that had been built within the walls of the Tower. Onlookers commented on her braveness and her piety. Two versions of her scaffold speech survive, both of which confirm that she acknowledged that she was to die under the law, having been condemned by it. She confirmed that she had offended the queen and had behaved unlawfully. Most importantly, particularly for her posthumous reputation, Jane proclaimed that she died a true Christian woman, and looked to be saved only by Christ's mercy. This confirmed her commitment to the Protestant faith, for Catholics traditionally believed that good works also played an important part in one's salvation. She then asked the onlookers to pray for her. Above: Queen Mary I, who ordered her cousin Lady Jane Grey's execution in February 1554. Lady Jane's female attendants then helped her off with her gown and gave her a handkerchief to use as a blindfold. Groping about in the dark, she could not find the scaffold, and cried, "Where is it? What shall I do?" Someone came forward to guide her and she rested her head upon the block. Mercifully, she was decapitated with one blow, probably just a few months short of her seventeenth birthday. Her remains were interred in the nearby chapel of St. Peter ad Vincula. With her passing, Lady Jane Grey's story became the stuff of legend. 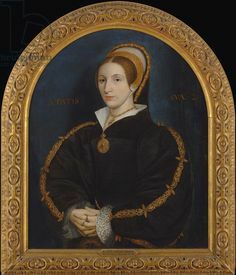 In Protestant works, most notably John Foxe's Book of Martyrs, she was depicted as a pious, virtuous Protestant maiden who had died for her faith, condemned by the cruel Catholic tyrant, Mary I. Victorian historians depicted her as an innocent victim of her grasping, scheming family, and portrayed Jane's mother, Lady Frances Brandon, as a tyrannical woman and an abusive mother. Modern historians have usually followed this version of events. But modern research has demonstrated that reality was more complex. Lady Jane Grey was far more than merely an innocent child, and there is no contemporary evidence to suggest that Frances was cruel to her daughters. Lady Jane Grey remains, in many respects, a mystery. Her beheading was the first of several calamities to befall the Grey family. Her father followed her to the scaffold only eleven days after her own death; like her, he was executed as a traitor to his queen. In spite of this, Jane's mother, Frances, remained close to Queen Mary, and her younger daughters Catherine and Mary were resident at court. However, Elizabeth I's accession proved to be the final undoing of the Grey family. While she did not behead either of the Grey sisters, as Mary had done, Elizabeth had both Catherine and Mary Grey imprisoned for their clandestine marriages, and the distraught Catherine died in 1568 while still in her twenties, deprived of her husband and children. Mary followed her to the grave ten years later, her own husband having predeceased her. Lady Jane Grey's story has been represented as a great tragedy, but her younger sisters were as much victims of their birth as she was.